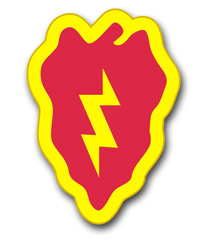 This Army 25th Infantry 10" Patch Vinyl Transfer Decal is an ArmyDecals.com exclusive. Proudly Made in the USA, our Vinyl transfer decals are made of the highest quality vinyl and UV resistant graphics available and are laminated to provide extra protection against the elements. Our U.S. Army Decals are the highest quality decals on the market! This vinyl transfer decal is made for OUTSIDE APPLICATION. Each is made at our facility in Scottsboro, AL.